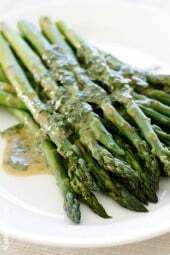 A simple asparagus side dish that really celebrates Spring. Serve it cold or room temperature, leftovers are wonderful chopped and mixed into a salad. This can easily be doubled or tripled. In a medium bowl, whisk mustard, vinegar and 1 tbsp oil. Add parsley and season with salt and pepper. Steam or boil asparagus for 2-3 minutes until cooked and tender. Drain and run under cold water to stop the cooking. 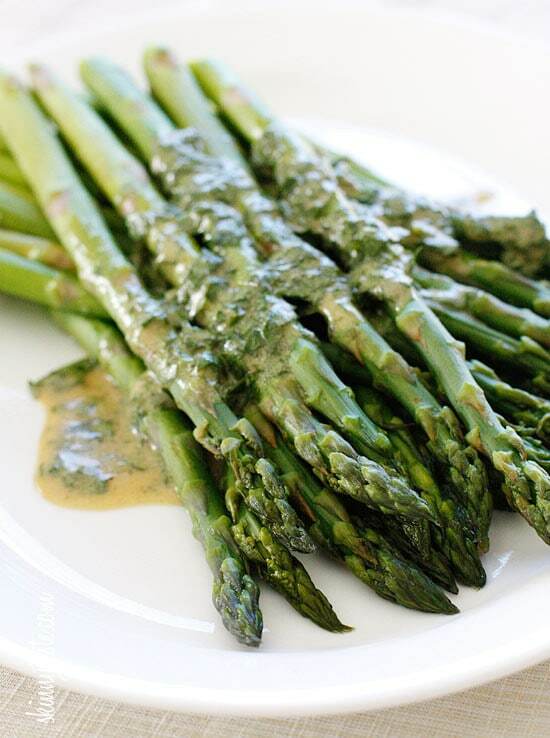 Transfer asparagus to a serving dish and drizzle with the vinaigrette. Would this recipe work with tarragon? 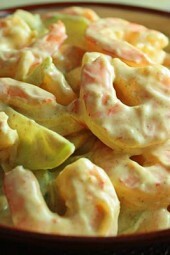 Gina – I love this Dijon vinaigrette and want to make a large serving of it for a big salad. Would you just double/triple each ingredient? I agree…Gina, can you clarify, please? Thanks! With how the points are created….sorry, I thought this was a reply to "Anonymous"
I don't understand where the WW points come from. The only ingredient I see with any points value is the olive oil-3 points for the entire recipe. Can you clarify? Thanks! How do you think this sauce would be on oven-roasted asparagus? 1/4th of the recipe or about 8 spears depending on their size. 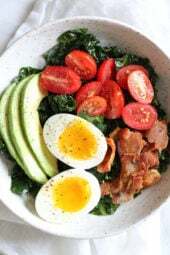 This was my first recipe from this website and it was great. As I am not a parsley fan I swapped it out with cilantro and added a touch of honey to take the edge off of the vinegar. Delicious! Will leaving out the olive oil, or cutting it down, change the taste? this was excellent! we love sauce so next time I'll double it. Oh and I didn't have parsley, but we don't like that anyhow. Thanks for the great and easy asparagus recipe! This was delicious! I had it with the Garlic Lover's Roast Beef and this sauce on the roast beef was delightful! i'm making this tonight! i will blog about it fa sho! Is the .25 ww points for the points plus program? not sodium… asparagus. i don't care much for asparagus… lol sorry i have something else on my mind haha. no, I LOVE THIS! Best asparagus recipe ever! This is actually REALLY good. Love it!! I usually don't care that much for sodium, but this was really good and the leftovers the next day of it were even better… love it. We loved this side dish. So easy too! I usually microwave w/ just enough water to cover the asparagus for 4.5 minutes, and it has the perfect crunch to it. Made this tonight. Fantastic!!! Hubby loved it, too! Thanks!!! 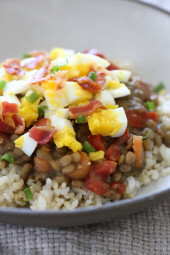 Just tried this recipe and it was delicious! Initially, I thought the red wine vinegar was too much….but it was PERFECT!! Thank you so much! Just came across this website and I can't wait to try some of these fabulous recipes! I love finding site with WW point value. Thank you!! She has awesome recipes!!! I love every one of them that I have tried. And even my husband will eat them and he is a picky eater. Sounds great! I've been looking for something to do with my asparagus that I love!